2018 Theme: Bacchanalia, the Reign of Caligula is described as "an immersive theatrical narrative" about the degenerate court of the infamous emperor. Guest are warned that the show "contains explicit sexual themes and violent content." Location to be announced. Drunken Devil Productions describes itself as a “Los Angeles-based, horror-centric live-entertainment company specializing in haunted nightlife, dining experiences, and special events." It stages parties and other activities throughout the year, sometimes during the Halloween season. 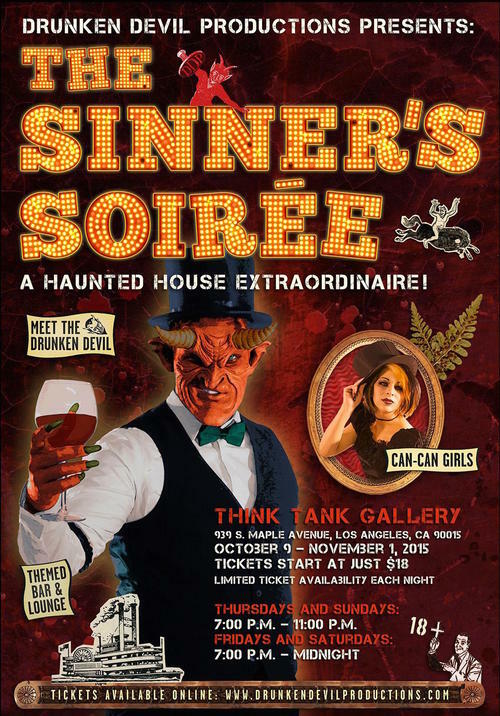 Drunken Devil Productions made its Halloween Haunt debut with "The Sinner's Soiree" in 2015. This 18-and-over event offered visitors a a chance to “encounter a menagerie of twisted, monstrous manifestations of vice and depravity” in a maze simulating a New Orleans-style descent into Hell, culminating in your arrival at a bar, where you could drown your eternal sorrows in (real) alcohol, while watching cabaret acts. After going on hiatus a couple of Halloweens, Drunken Devil returned in 2017 with "Night of 1,000 Devils" - an intimate, 21-and-over soiree open to 100 guests. Black formal attire is required. Location to be announced.